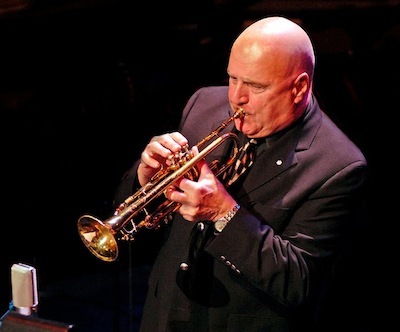 Guido Basso (trumpet, flugelhorn, harmonica, conductor, arranger and composer) was born in Montreal in 1937. Guido was only nine years old when he began playing the trumpet, becoming recognized as a prodigy while studying at Montreal’s Conservatoire de musique du Quebec. He was just a teenager when he was already becoming prominent on the Montreal club scene, where singer Vic Damone first heard him and took him on an international tour with him for two years. In 1958 he joined singer Pearl Bailey and her bandleader husband, famed drummer Louis Bellson, touring North America with them for three years before moving to Toronto to join the busy studio and television scene there. 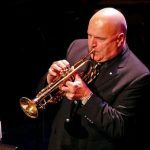 His playing career as stan-out sidemand and leader, soared, and he became one ot the biggest jazz names in the country, and beginning in 1975, frequently organized and led big band concerts at toronto’s Canadian National Exhibition featuring jazz luminaries including Dizzy Gillespie, Quincy Jones, Woody Herman, Duke Ellington and Count Basie. He can be heard on hundreds of record albums, CD’s, playing and recording with stars from Buddy Rich to Diana Krall.